Discover paintings, one of a kind Fishirts, prints and other unique finds. I draw inspiration from my surroundings. 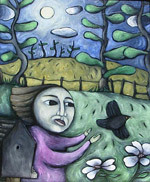 I find the landscape stimulating and I think the Island way of life influences the style of my work. Having that connection to the land and people, I feel is what defines me as an artist.